I've been oil pulling off and on now for several years. Since a number of people have recently asked about it, and since I've finally found some scientific studies verifying that oil pulling works, I decided to pull together some oil pulling questions and answers. Oil pulling is the act of placing roughly a tablespoon of a good quality oil (preferably unrefined and organic) in your mouth and swishing the oil around for 15-20 minutes, forcing it back and forth through the teeth. The oil is then spit out (DO NOT SWALLOW THE OIL), and the mouth is rinsed with water or salt water and/or the teeth are brushed. It depends on which recommendations you follow. Oil pulling is typically done first thing in the morning, before eating, and can be repeated up to three times per day. If you don't have time in the morning, you can do it at other times during the day. Need more info on how to oil pull? Just watch the simple Mama Natural video below. Which oil should I use for oil pulling? Sunflower, sesame and coconut are the most common, but many other oils are used. I prefer coconut oil, and normally use Nutiva. I keep a jar on my counter that I refill from my gallon container. On Earth Clinic, contributors discuss using sesame, sunflower, olive, walnut, macadamia, coconut, Udo's Oil, Total EFA Oil and others. I have seen some references where people's teeth took on a yellow tinge from using olive oil, so that probably wouldn't be my first choice. Oilpulling.com recommends sunflower and sesame. Doesn't putting a large amount of oil in your mouth make you want to gag, and doesn't your mouth get sore from swishing? When I first started doing this, it did feel a little weird. I find the coconut oil easier to use than liquid oil (my coconut oil is solid or semi-solid most of the year). I put a spoonful in my cheek and let it warm up and melt, and it gives me a minute or two to get used to that much oil in my mouth. You can start with smaller amounts and work up to a tablespoon. If swishing for 15-20 minutes is too much, start with 5-10 minutes and work up to a longer time period. You don't have swish constantly – you can take a break now and then. Once you get used to it, it's really not a big deal, but my cheeks were a bit sore at first. How do you find time to do oil pulling for 20 minutes? I usually oil pull as I am getting ready to shower and in the shower, when my kids normally give me a bit of privacy and stop asking questions for a few minutes. They've gotten used to mom responding in “mmmmm..hhmmm….hmmm…”. (“Oh you're oil pulling, okay. I'll come back in a few minutes.”) When you're done, spitting outside off the beaten path, in the garbage or compost is preferred. Coconut oil down the sink drain may lead to clogged pipes. (This is the short list – there are more. No claims that it raises the dead yet.) 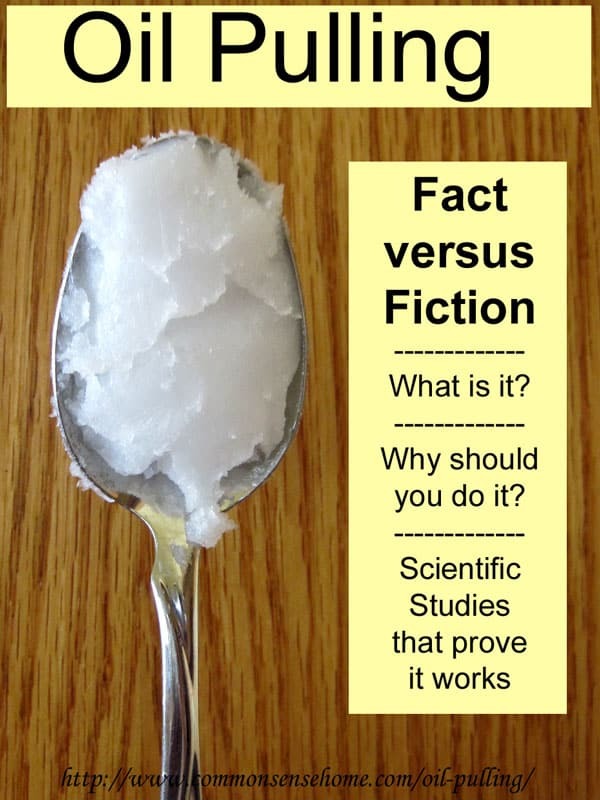 The Coconut Oil Research Center also endorses oil pulling. Personally, I've found that it makes my teeth feel smooth and clean, and has lightened some of my teeth stains but not removed them. I notice that it helps clear out sinus congestion. After pulling for a while, the crud will literally work loose from my nose and throat area, and I can spit it all out when I spit out the oil. I found several scientific studies verifying that oil pulling is helpful for oral health. I think other claims would be very hard to measure. Oil pulling reduces harmful bacteria in the mouth – Effect of oil pulling on Streptococcus mutans count in plaque and saliva using Dentocult SM Strip mutans test: a randomized, controlled, triple-blind study. Sesame and sunflower oils on their own do not fight mouth bacteria, but the action of oil pulling changes them (enzyme action and emulsification action) so that they can lift contaminants from teeth – Mechanism of oil-pulling therapy – in vitro study. Oil Pulling for Detox? – maybe, maybe not. I have read some accounts of people who have experienced mouth irritation from oil pulling. If this happens, discontinue, try a different oil or pull less frequently. Don't swallow the oil, because it looks like it will be filled with dead bacteria and other things that are better out than in – not a yummy. Some people also express concern that oil pulling may pull mercury out of metal fillings and put it into circulation in the body. It's up to you to decide if this is a concern for you. I have fillings in my teeth and have never had one come loose during oil pulling. My son did manage to loosen a temporary filling, which needed to be replaced. We used a filling repair kit to plug the hole until we could get in to see the dentist. Have you ever come across anyone whose fillings were loosened by oil-pulling? Someone on Facebook mentioned their dentist said it could happen. I asked my Ayurvedic doctor about it and she said she’d never heard of that. Hoping it’s just a myth as I love oil-pulling! Stops my mouth feeling yucky in the mornings. I’ve heard stories about fillings being loosened during any change in dental routine, so it’s possible, but not likely. It seems in the majority of cases, oil pulling helps to strengthen the enamel, which seems to me like it would help keep fillings in place. From personal experience, I have a mouth full of metal (from my younger years), and have been pulling off and on for a couple of years, and never had a filling come loose. Forget oil pulling; use wildflower honey instead. Taste better and does the same thing in regards to oral hygiene. The sugar from the honey will wreak havoc on your teeth over time. This maybe a off the wall question but do you brush your teeth first before oil pulling? From what I’ve seen, brushing after oil pulling is more commonly recommended, as oil pulling may loosen plaque or other deposits and make them easier to remove by brushing. Sounds like something a for-profit dentist would say to discourage his patients from doing anything that could hurt his sales. Took the words right out of my freshly oil pulled* mouth! I was thinking the same thing. Doctors and dentists often discourage a lot of natural, healthy techniques to keep us coming back. I am not sure if it’s what you are talking about, or what your friend was talking about, but oil pulling is so good at pulling toxic build up from your mouth it actually can affect some amalgam fillings, and pull the Mercury toxicisity out of it into your system. Those are no Bueno anyway, so if someone has them, research having them removed, or depending on the tooth- pulled- which is the safest option to have them removed. That seems like a logical answer. Thanks! I hope you find something that will help whatever’s going on in your mouth. I just recently visited a Holistic dentist and the hygienists recommend a mouth rinse to kill mouth bacteria even though I told her I have been oil-pulling. Since oil-pulling supposedly kills mouth bacteria, is it necessary to purchase the mouth rinse? Also, a toothpaste was recommended that has carrangean. The hygienists assured me its been checked out and her family used this toothpaste. What do you think? From what I’ve read about carrageenan most recently, I wouldn’t use or recommend it, but I haven’t studied it in detail. All the studies seem to confirm that oil pulling does reduce problematic mouth bacteria, so i don’t understand a need for a mouth rinse in addition to oil pulling. I have burning tongue syndrome I was wondering if this is what you were suffering from possibly? For burning tongue syndrome I would try ginger and turmeric in capsule form to help reduce inflammation as well as 1-200 mg fish oil daily. look up candida, to see if this could be your mouth problem. which coconut oil is good for. Have you looked into probiotic treatments a lot of mouth ailments stem from Gut issues. How long does it take before you noticed results? Me teeth felt smoother and cleaner right away. Stains fade with multiple uses, but results are not nearly as dramatic as chemical whiteners. On the more aggressive mouth problems, I’m not sure. I think my teeth are whiter than the OTC whiteners. Maybe not what they would be from a professional whitening, but not $600.00 either! I experienced physical detox after about 2 weeks of every other day use and when I say physical I mean little granules of gunk. Could those have been tonsil stones? My youngest gets tonsil stones, and oil pulling helps loosen and clear them. I’ve just started oil pulling for the last 2weeks. Let me say that my translucent teeth have really started to remineralize. I lost a lot of enamel because of my upset stomach and burping for the last 30 years. I’m surprised that I survived. I’ve had to do a total detox by going mostly vegan. And with oil pulling my whole body is going great! My skin, hair, teeth, nails are recouping. This after listening to doctors trying to help, but they have no resources. They’ve been taught to give us a silver bullet or pills that don’t work. They don’t for the most part. If it took a long time for the sickness to overtake our immune system and has been a part of us for a long time, then it will take a long time for our bodies to completely turn around, but what a great reversal. I’m enjoying this revitalization. I’m walking on the sunny side of the street, all smiles. And I’m 60 going on 20. My breathing is better, my posture looks to be on a 20 year old. I’ve always been a nonconformist so doctors and dentists don’t love me. I have no use for them. I’m back in the race. I’m totally there. Hey. Come on life, give all you got. I get allergy shots every week, is it ok to do oil pulling or will it affect my shots? Ive never tryed oil pulling but i thought maybe it could help with my sinuses because i have sinus disease. I haven’t been able to find anything definitive on this. My gut feeling is that it shouldn’t present any problems, but if you try it, do take careful note of any differences you feel when you include oil pulling in your routine – for better or worse. You may also wish to consult your doctor (although it’s been my experience that not too many are familiar with oil pulling in any fashion). My husband has been on allergy shots almost 2 years and oil pulling for at least 1 year pretty consistently, no issues for him, so that’s just one case, but thought I’d share even though everyone may be different! Can I use extra virgin olive oil. Yes, but some people report that olive oil yellows their teeth. I am already sold on coconut oil, so I will add this to the many things I use it for now. I’ve swallowed it, so swishing it isn’t a problem. I’ve got it in right now, will update later after I’ve done it for awhile. So glad I found this through Pinterest. Thank you! Alexis – you’ve very welcome. I’ve done oil pulling for a while, so i was glad to finally find (and share) actual studies that show its effectiveness. I doubt swallowing it can do any harm, bacteria have a harder time in stomach acid than in your mouth or sinuses, but it would feel gross going down. The only credible evidence I’ve seen supporting the notion that swallowing FOOD that has been swished on your mouth can be harmful is the report of a woman who aspirated pulled oil when attempting to swallow it. This may come as a shock, but that is a risk associated with aspirating *anything*. Don’t aspirate your food, kids, it could be fatal whether you swished it in your mouth or not. As for the notion that pulled oil contains mysterious “toxins” magically extracted from the body through the mouth, what a bunch of malarkey. Any and all systemic benefits associated with oil pulling are attributable to the benefits gleaned from improved oral hygiene – there is no mystical “detoxification” here, just the physical removal of oral bacteria and parasites. I would think it obvious that any of these which has taken up residence in the mouth *already* exists in the gastrointestinal tract *if* they are able to survive there, and an influx carried in by oil that has antibacterial properties in its own right is not going to make an impact in that inhospitable environment (though if one were concerned about it, walnut hull extract + wormwood tea + fresh ground cloves will make more of a positive impact than spitting food in the trash). So, if I’m understanding you correctly, then the coconut oil, honey and oatmeal I use to clean my face should be scraped off and eaten for breakfast, rather than washed down the drain, because it’s “good food”. I know when I oil pull that I remove plaque, and sometimes have a significant amount of sinus drainage. I think I’ll skip chowing down on that, but you and others are certainly welcome to do as you see fit. This is true but you have to also remember that it must pass through the esophagus first which could leave residual bacteria behind. Better to be safe than sorry–so you may want to spit it out! Can you do it while Pregnant ? I don’t see any reason why not, unless you have a large number of amalgam fillings. Then there may be some concerns. why would there be concerns when you have amalgams in and oil pulling? Some lab tests indicate that regular oil pulling may put more mercury from the amalgam into circulation in the body than just having the filling sitting there. That’s good thought it shows humans what kind of trustful dentist put into us that poison us BTW your living pulp brings the mercury right into blood stream don’t see how it is worse to keep spitting out larger toxins every time eventually the dose of that filling will weaken dentists did not do studies of how living teeth with blood comes into direct contact to mercury fillings!! Nah – just start with whatever you’re comfortable with. I used less when I first got started. I’ve used both coconut oil solid form and liquid as well as the seasame. It is much easier if you start with the liquid form. When I started with the solid, I had a much harder time and felt like it was a lot, but when it was the liquid, MUCH easier. I have found that oil pulling while showering is the easiest and best way for me. The time goes by much easier as well as killing 2 birds with one stone time wise. The second article talks about the oil pulling combined with the health benefits of the seasame oil. Thanks so much for an informative article – I have had great success with oil pulling – my gums were not good – I use coconut oil and I try to check with hubby to see if he needs anything before I oil pull – I easily worked up to 20 minutes – I also do it while I am getting ready for the day. Hello, I’ve been reading some of the amazing results people have been getting with oilpulling. I recently discovered oilpulling, on another website and decided to give it a go, plus I’ve seen videos on YouTube. I couldn’t find sesame oil but sunflower oil was the alternative from the info I got. I’ve swished once for 20mins, which was no problem, but while swishing, the right side of my throat started to feel sore. I didn’t feel well afterwards, I didn’t want to eat and havn’t, I felt cold and I have a headache. In one of the videos I watched, the lady said this would happen, but I didn’t think it would happen straight away. Is this normal? I don’t want to stop this technique, as I feel it is the natural solution to solving my body problems. I’m going through the menopause. If possible, I’d consult a natural practitioner. You may want to try a different oil, such as coconut, and a shorter time period (say ten minutes) to start. I’ve never had those sort of symptoms. I know that loose fillings have been discussed above. But I’ve wondered if Oil Pulling could cause the mercury in fillings to leach out? There’s some disagreement on this. Some sources say yes, some say no. The action of chewing puts pressure on the tooth, and that’s not happening here, but the fluid is actively moving around the tooth. Since you spit out the oil, I would think that any mercury that leaches out of the amalgam would be spat out with the oil. I do know that significant amounts of gum chewing are not recommend for people with amalgams, because you chew and swallow (saliva) with no real food in place to buffer the teeth. When the mercury leaches out into the oil it is then quickly being absorbed into the bloodstream from underneath your tongue the same as any sublingual medication that is placed under your tongue for the fastest absorption such as meds to help prevent heart attack’s or meds to prevent vomiting. Has anyone tried hemp oil? i was given about a gallon of it, and thought this may be a good use. I haven’t tried it, but several sites do recommend it. Have you read anything about oil pulling with coconut oil while having amalgam fillings? I thought I read somewhere that it isn’t good and I’m wondering if you heard the same? Oooops, I just saw that you replied to a question like this, sorry… no reply is necessary. I was checking out this post earlier this week and now coming back to visit it again. I just started oil pulling and your article was so helpful getting started! Thanks for compiling all the information into one spot. You’re the best!! Thanks, Amber. I’ve been working my way through the adaptogens book recommended in the HANE course, and will be getting back into the rest of the course soon. My boyfriend and I just started oil pulling today. We both have dental problems but he has terribly bleeding gums and he noticed a big difference in just one day! I can’t wait to see the results after a few weeks! That’s wonderful! Thanks so much for letting me know. Sensitive gums are common with thyroid issues (which I have) and I know oil pulling is a big help to me if my gums start acting up. Ever since I got pregnant with my first child my teeth have went down hill. I want to start the oil pulling but how many times a day do you do it?And am I suppose to stop brushing my teeth all together? Don’t quit brushing. Try it a few times a week and see how you feel, then try it more or less frequently based on your reaction. I’d also highly recommend the book “Deep Nutrition“, given that you mentioned health problems associated with getting pregnant. I think the whole point of oil pulling is to remove toxins from your body – if you swallow it, that would just be reintroducing the toxins. I follow advice from other sources that say to spit it in the trash – that way you are not introducing the toxins into the water supply, or clogging up any pipes. That’s not “the whole point of oil pulling”, it’s just unfounded mysticism with no basis in fact. The “point” is oral hygiene, a benefit with credible evidence to support it. Ludicrous claims of “whole body detoxification” should be put in the category of “snake oil pulling”. David, there is evidence to support detoxing. Not just oral health. So those of you that have sinusitis and other health issues, pull away! I’m with David on this one. Even the link in the above article (Oil pulling for detox?) states that the benefits are solely for oral health. Mouth infections are serious and can impact your overall health, but that article states that in no way is anyone “pulling” toxins from anywhere else but your mouth. That article is sensible, researched and with sources cited. 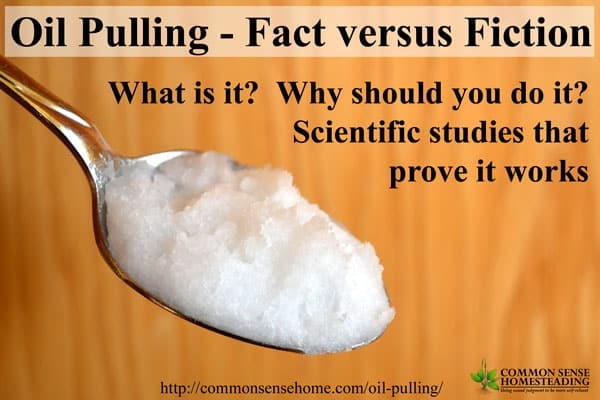 And if you believe oil “pulling” is going to heal your diabetes or hemmoroids, then, friend, you better be prepared to “pull” with all your might. Hey – thanks for the information. I just started this week and feel amazing. I have Sjogren’s Syndrome which is dry eyes and dry mouth – and any other moist areas. Recently diagnosed with several additional issues that go along as well. Dental health is a huge issue. But got immediate relief on the dry mouth deal at first rinse and brush. Discovered a few months ago I am allergic to toothpaste and some really nasty stuff recurring in my mouth tongue gums and lips cleared immediately when I stopped using regular toothpaste. But the dry mouth thing is awful. Plan to contact my rheumatologist to let him know about this! Thanks for sharing your experience and I’m glad it gave you some relief. I too have the same condition. How gas this been working so far. My nights are the worst so I’m thinking about trying this. I oil pull every morning. Oil pulling makes my teeth and mouth feel cleaner and I feel it is beneficial for overall health. Have a lot of fillings from my childhood, but have had no problems with oil pulling. Did have a hard time oil pulling until I found an oil I could tolerate so don’t be afraid to try different oils. To my oil for pulling, I add a drop of peppermint essential oil for added benefits. I do brush afterwards with a natural toothpaste. Please be aware of the ingredient list on your toothpaste. Note that most toothpastes say call poison control if swallowed – which is usually due to the fluoride, but many of the other ingredients are not something I want in my mouth or body. Wanted to share that there is a free app called Skin Deep that lists ingredients that have use restrictions for many personal care products. Thanks for sharing the great information in your oil pulling article. Another strange ingredient that has ended up in some toothpastes are plastic microbeads, which dental hygienists are now finding imbedded at the gumline. Thanks for sharing your experience. It should be safe, but make sure to check with your dentist, just in case there might be any reason to avoid it. Depending on the length of time your braces are on, regular pulling might make the exposed enamel a lighter shade than the covered enamel. To strengthen teeth bone broth is a great mix of readily available minerals and gelatin. You may also try a remineralizing tooth powder or paste for surface treatment. The book “Cure Tooth Decay” gives a comprehensive explanation on how to strengthen and rebuild teeth. Pulling for the first time right now. I have been swallowing it for digestion issues for the past year and have fallen in love with coconut oil (unrefined and virgin) with all its great uses who wouldn’t love this stuff. This may sound like a silly question, but I would prefer to do this at night. Is there any problem with me doing this just before bed instead of in the AM? If that’s when you have time, that’s when you have time. I don’t believe it will make a significant difference. I asked a midwife and she said that it is generally considered safe for pregnant women, especially after the first trimester. Oral health is especially important during pregnancy so I’ve always been glad to have an extra way to keep my teeth and gums healthy while pregnant. (Purely anecdotal- I haven’t had a cavity, even while pregnant, since I started oil pulling and my oral health routine). As with anything, check with a doctor or midwife before doing oil pulling, especially if pregnant. Laurie, I love how you say self-sustainability is just about making common sense choices to improve your life. Amen, sister! I have been wanting to try oil pulling for a while and now I think I finally will because of this great post. Thank you for sharing, cheers! Does oil pulling help with infections in the body (specifically the hands and feet)? Some may claim that it helps, but I haven’t found any studies to back this claim up. I didn’t first try oil pulling for this, but it is fabulous for my chronic dry mouth. Consuming coconut oil and other quality oils regularly can also help with dry eyes and dry skin. Our bodies need fat to function! Shortly before Easter, my teeth started acting up because of receeding gums. I had no idea when I would find the time to go my dentist before the long easter weekend. So I tried oil pulling for the first time. Olive oil. And againg the next morning. And lookie, I could bite down on my food again without pain. As soon as the stores re-opened after the holidays I switched over to coconut oil. The taste of olive oil, even with a few drops of essential sage oil was just too much first thing in the morning ( I have to wake up at 4:30am). On work days, I additionally rinse my mouth with water and a drop of peppermint oil. For the freshness. Other than that, I brush my teeth with plain water spitting everything out several times in the process. Don’t think I’ll be needing my dentist anytime soon! That’s great! Thanks for sharing your experience, and I’m so glad that it helped. I have been oil pulling for about 12 months, rotating between coconut oil and sesame oil. As a child of the 60s/70s, I have extensive dental work and I am passionate about preserving my teeth and preventing any further major dental work, fillings etc. I ditched the fluoride toothpaste and commercial mouthwash (much to my family’s horror!) in favour of mineral/herbal/essential oil toothpaste and mouthwash. I upped my vitamin c intake, mixed Aloe Vera or apple cider vinegar in my drinking water in the mornings. As well, I rinsed with warm salty water after oil pulling and used a homeopathic gum health spray at night. So after actively pursuing improved dental health, I had to face my fear of actually going to the dentist…. I have a crown which my previous dentist wanted to replace with an implant as she believed it was ‘unstable and not likely to last too long’. I asked around for a potential new dentist amongst friends and work colleagues and after much procrastinating, made an appointment. I was so nervous and my imagination was running wild with worst case scenarios. It had been 3 years since my last dental checkup – but I only confessed to 15 months… Bottom line, I had virtually no plaque, my so-called ‘unstable’ crown turns out to be secure and healthy on X-ray, he said my gums were exceptional and teeth were in good shape. I was so happy and pleased with my checkup. I know for sure that the combo of oil pulling and stopping the popular fluoride based products brought back my oral health – despite other people’s fears! It was important for me to face my fear of the dentist and it is even better because I proved that natural therapies are so much more effective and healing than the mainstream products. I turned my dental health around – you can too! Excellent article and it certainly stirred a lot of interest – your community is something I aspire to, but have yet to start encouraging. The earlier reports on oil pulling from Russia described Herxheimer reactions, presumably as the toxic load was reduced enough to allow the natural detoxification of the body to kick in. I find that a teaspoon (5ml) is plenty – by the time one gets to the 20 minute mark one’s mouth is full anyway with the emulsified oil. I have been oil pulling every day for two weeks with unrefined organic coconut oil. I do it first thing in the morning for 20 minutes, as recommended. My question is, how long does it usually take for plaque build up to be reduced. I notice that every time I oil pull, I still have a lot of plaque on my teeth and still need to brush. I’ve had different sources say that with the oil pulling, brushing shouldn’t be necessary. I have been brushing mainly to get rid of the plaque, which makes it hard for me to judge if the oil pulling is actually making a difference. Has anyone else had this problem? Personally, while my plaque has been reduced, I haven’t given up brushing. The biggest difference I’ve noticed is reduced gum inflammation. Loved the way my teeth and gums looked within 2 days of oil pulling wih coconut. Even got rid of an ulcer looking thing that didn’t cause pain or discomfort but didn’t like the look of it at all. Gums starting improving, stains disappearing, overall I was enjoying it for numerous benefits. However my teeth started to get sensitive after about a week and a half of pulling. I use pro enamel tooth paste for yrs and haven’t had an issue with sensitivity. .. what do you suggest. I’d reduce the frequency of pulling, or stop completely for a while and see what happens. It sounds like you need to find a balance between what makes your teeth happy and what makes your gums happy. Do you think oil pulling will help the infections I already have in my jaw which antibiotics haven’t completely cured. The infections were a result of root canal treatment I have had over the years. I am due to have implants in the new year. Any suggestions please. Oil pulling sounds very interesting and promising. As a reader I want to read what the most prestigious study says first, and giving me only titles leaves me with work to do to figure out what is worth reading. My job is not to spoon feed my readers information or make decisions for them, but to provide them with enough information that they can make their own decisions. I expect my readers to work. If you are not a person who is willing to do some work for themselves, you are on the wrong website. I have been oil pulling for 10 weeks after reading about it extensively. I do it at night before bed. Relieve dry mouth due to autoimmune disease, guard against cavities, and improve gum health. “Pull toxins out of body” sounded great, but vague. My teeth and gums feel and look great. I’ve experienced a couple of other improvements that I haven’t read about happening to other people. The first is I no longer have leg / foot cramps. I had them 3-4 times a week in the morning and they were severe. The second is that my mood is stable; no more lows. I am going to continue and see what else improves. If you haven’t tried it, I recommend that you do! Thanks for sharing your experience, Elizabeth. I’ve tried oil pulling with Coconut Oil in the past, but between my urgent need for food first thing in the morning and my dog whining to be let out, I have trouble doing it first thing :(. I shal follow your recomendation however, to do it at some other time of the day, I take it preferrably befor eating a meal? I also disliked the taste of oil in my mouth so I added a little bit of xylitol – which is also reputed to be good for the teeth – and that made a world of difference! I completely understand the morning time crunch. Yes, you’re looking for a time frame where your teeth aren’t newly coated with fresh food bits. I’ve got very very sore and bleeding gums. I don’t like taking painkillers but it was getting too much. I tried it for 10 minutes and softly brushed my teeth after. No blood and definitely not as sore. Im going to start doing it twice day now!!!!! So glad that you saw an improvement! Thanks for sharing your experience. Do you have to brush your teeth normal after oil pulling?! And can you use mouth wash after? It’s generally suggested that you brush after to remove any deposits that the pulling may have loosened. I suppose you could use mouth wash after, but I don’t see much point in doing so. Just a note…if you should do oil pulling, when you are done….spit the oil into a napkin or into the trash —– not into your sink….Coconut oil will solidify, your pipes to accumulate and a mess with clogs! This is all good stuff, HOWEVER, please PLEASE please do not oil pull if you have mercury fillings. The oil pull can have some serious effects on these fillings and the teeth. oil pulling can pull the mercury layer upon layer at a time in your mouth well after an oil pull treatment, thus giving your body exposed mercury poisoning. The worst I had seen of a close friend of the family doing an oil pull was that she lost her mercury filling after an oil pull right before bed. She swallowed the mercury filling that became dislodged due to doing a few oil pulls that week. It’s bad enough she suffers from that wired thing called fibromyalgia atop of this heavy metal poisoning. There are a few holistic dentists in North America. There is even a website to locate them too. Can’t remember the site name though. They would help in situations like this. I agree with Honky Tonk in TN. Do not oil pull if you have amalgam fillings. I speak from experience. Recently I decided to try oil pulling, and did it only once. I used unrefined, cold pressed organic coconut oil. I don’t recall if I brushed after to remove any deposits the pulling may have loosened, as Laurie suggests, since I hadn’t read that before coming to this site. I also added a small amount of coconut oil to my Trader Joe’s floride-free toothpaste on my brush several times because I read how good it can be as well. I fractured a tooth. Since that damage, I am afraid to even try OraMD, which is a natural oral hygiene product that only contains peppermint oil, spearmint oil and sweet almond oil, for fear that something else can go wrong. All of these natural remedies are great, but they can be very powerful. Does rough teeth which have lines (because of cleaning abrasive of braces by drill or scaling tool) on them can become smooth by oil pulling ? I also have thin teeth so they will be strengthen and remineralize by oil pulling? Oil pulling is not likely to make rough teeth smooth or thin teeth remineralized. For that, diet change and supplements are your best option. A good resource is the book Cure Tooth Decay by Ramiel Nagel. Sometimes even the those cleaned teeth feel sensitive and different does that mean there are chances of chipping or cracking it or it can be preserved till long without dental treatment because now I’m afraid going to dentist? I can’t tell you what’s going to happen to your teeth over the internet, but you could try this remineralizing tooth powder recipe from my friend Chris – DIY Remineralizing Tooth Powder that May Cure Tooth Decay. It may help improve the feel of your teeth. Sometimes those cleaned( removal of adhesive of braces by scaler tool or drill) teeth feels sensitive and different does that mean that there are chances chipping or cracking it or it will be preserved till long without dental treatment I’m afraid going to dentist now ? Afraid or not, you should probably see a dentist. I am not a dentist. I can only assume that if they did your braces correctly, there should be no serious tooth damage, because otherwise everyone who ever had braces would have big problems with their teeth. Actually I went to dentist I did my X-ray and he said that everything looks ok just u have much loss of enamel on front 4 teeth that’s the reason for transulency and he said if there is no pain or sensitivity there is no need to treat because natural teeth are always better! I want to ask that Can those Rough deep lines can go away naturally at home because I’m afraid going to dentist now. I’m sorry, but I’m not a dentist. I do know it is possible to build up enamel on healthy, living teeth. I’d suggest trying the options listed in the Cure Tooth Decay book and using the remineralizing tooth powder. Oil pulling will help improve gum health, but I have not heard of it building up enamel on teeth. I personally know people who have used Ramiel Nagel’s methods to heal cavities. I have not tried it myself, because his rules are pretty strict, but I do believe those who told me it worked for them. I don’t use or recommend fluoride products. I believe other options are better with less risk. Do thin teeths (front ones) can be preserved life long naturally without any dental treatments? Maybe. There is no one answer. It depends on your diet and dental care. Adding my two-cents worth of direct experience. Did some oil pulling using virgin coconut oil (ridiculously cheap here in the Philippines, $3 for a 250ml bottle). I did it in the mornings, per some web advice, even before my first drink of water. I’d swish it around the mouth for ten min as I tidy up my bedroom or prepare bfast. I even ‘scrub’ my teeth with my tongue. After I dispose of the used oil (down the drain, I don’t worry about clogging because we’re in a tropical country and it can be further helped by pouring the remaining hot water from the kettle), I take in a fresh tbsp, this time to get my digestive system working. It seems to work pretty well. After coming across this site, I’d like to shift pulling to evening before bed instead as ‘pulling out the toxins’ after a day’s work seems to make some sense.